Each month at the CERN Foundation we sit down with unique and inspiring individuals that work to make this effort a success. This month we talked with Alvina Acquaye, MS about her participation in the Ependymoma Outcomes Projects, whose goals are to increase quality of life in patients diagnosed with ependymoma. Ms. Acquaye brings her expertise in psychology and counseling to the CERN Foundation after earning her Master’s of Science Degree at the University of Houston-Clear Lake in 2010 and her Bachelor of Science from the University of Houston in 2006. Alvina chose to obtain her degree in Psychology almost immediately after taking her first course where she became fascinated with how the mind works and studying individual behaviors and personality. Alvina was born in Oklahoma City and moved to Africa with her family until the age of six. At that point her family decided to move back to the United States and settled in Texas. Alvina enjoys living in Texas and when she is not working, she spends her time exercising and reading. In November of 2008, Alvina started working as a Research Assistant II, under the leadership and guidance of Dr. Mark Gilbert, the CERN Foundations Principal Investigator, and Dr. Terri Armstrong, creator of the Adult Ependymoma Outcomes Project. As part of her current role as a Research Associate, Alvina also fulfills the role of the Adult and Pediatric Ependymoma Outcomes Project Coordinator. 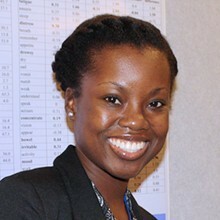 As the coordinator of both projects, Alvina works with the participants involved to ensure that all of the necessary information is exchanged correctly, issues study IDs so that patients and their caregivers can confidentially complete the survey and maintains the Pediatric and Adult Ependymoma Outcome Project’s database. The Adult and Pediatric Ependymoma Outcomes Project were created in 2009 and 2010, respectively with the goal to reach out to patients in hopes of gaining experiential information to determine ways to increase the quality of life in patients diagnosed with ependymoma. The CERN Foundation continues to grow, shine and most importantly generate a better understanding of this rare disease because of the hard work and pride that individuals like Alvina Acquaye bring to our team. Gratitude and recognition goes out to the following team members: Mark Gilbert, M.D, and Terri Armstrong, Ph.D., A.N.P-B.C. and Elizabeth Vera, MS.